Mystarting123.com is presented as a sleek, intuitive, and powerful search engine, so it is not surprising at all that so many users expect it to be a useful search engine that can improve their web searching experience. Unfortunately, it is far from being decent – it has been found that Mystarting123.com is a typical browser hijacker which alters the settings of browsers right after the entrance. Because of this, you will see it set as your homepage, search engine, and a New Tab page. 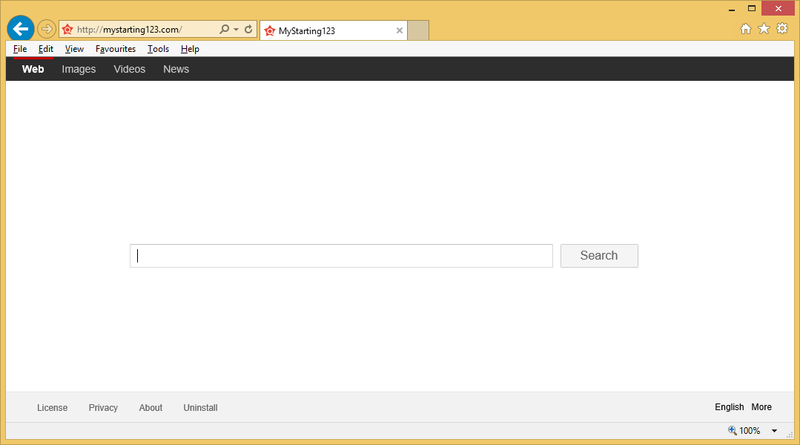 If you do not do anything about that, Mystarting123.com will be opened for you each time you launch your browser. Some users do not pay much attention to the new settings applied, whereas others immediately understand that these changes have been made on their computers without their permission. We hope you belong to the second group of people and decided to go to uninstall Mystarting123.com from your browsers as soon as possible. Why should I remove Mystarting123.com? If you have opened your web browser and discovered Mystarting123.com there, you need to go to remove this search tool as soon as possible. Although this search engine looks beneficial, it will diminish your web searching experience to a great extent by displaying irritating advertisements on your screen. These ads are not shown to users when they surf websites. Instead, users find them on its search results page. Since Mystarting123.com looks quite decent at first glance, many users fearlessly use this search tool and eventually click on those commercial advertisements. This activity might have undesirable outcomes – users might be redirected to untrustworthy pages of third parties. These pages might contain malware, collect information about users, or try to convince users to invest in useless software. Some users believe that they could easily avoid those ads, but it is not true because it is not so easy to recognize them when they look like normal search results. We know the only solution to the problem in this case – the Mystarting123.com removal. Why is Mystarting123.com set on my browsers? If Mystarting123.com has become visible on your browsers out of the blue, it is very likely that a browser hijacker has successfully entered your system. These infections do not have official websites, so it is usually not a user’s fault that they show up on computers. In most cases, browser hijackers arrive on computers in software bundles and enter systems illegally. Most probably, Mystarting123.com has used this method to enter your computer too. How can I delete Mystarting123.com? You need to remove Mystarting123.com from all your web browsers no matter what the story behind its entrance is. You can do this either manually or automatically, but if you let us tell our opinion, we suggest that you go to remove Mystarting123.com automatically. It is the easiest undesirable search tools/undesirable software removal method because all users have to do is to launch the downloaded scanner. Always use only legitimate anti-malware/anti-spyware tools because those untrustworthy ones might cause you many problems by installing additional malware.